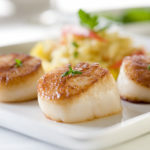 One of our favorite special occasion meals is Pan Seared Sea Scallops. No, this isn’t a dish that you would make weekly. But it is an amazing, easy to make meal that is perfect for a special occasion. Perfectly cooked sea scallop – ready to be drizzled with the herb butter. I first had sea scallops at a benefit auction dinner. I fell in love with them right there. They were tender, juicy, and drizzled with an herb butter glaze. Served with garlic mashed potatoes and grilled asparagus, I felt that I just had a meal that was made for a king (or queen in my case). I knew that this was something that I wanted more often! Raw sea scallops ready to be cooked for a special occasion. That was until I saw the price of the scallops in the grocery store. WOW! I had pure sticker shock! I put buying them in the store on hold and embraced the memories of the perfect pan seared sea scallops that I had at the auction. So the next opportunity that I had to order them at a restaurant, I jumped at the chance. Unfortunately, the experience wasn’t the same. Be sure that the bottoms of the scallops are nice and brown before turning. The pan seared sea scallops that I ordered off the menu were chewy and dry. I was in disbelief. How could something that I once fell in love with turn out so bland and awful? So I turned to one of my chef mentors to help me out. She explained to me that many people overcook the scallops, which results in a tough to chew texture. Being familiar with cooking different types of fish in general, I knew exactly what she meant. I have been making salmon for years, and the key to making them perfect is to cook the filets just to the point of being done so they remain light and flaky. The same principles apply pan seared sea scallops. 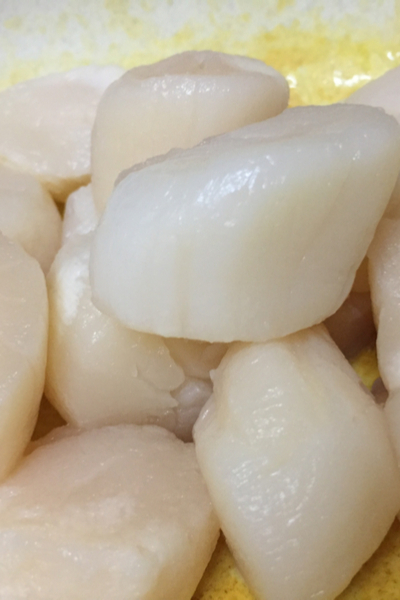 Although sea scallops are quite thick in nature, the cooking time only takes minutes. Scallops cooked perfectly in an oil and butter mixture. Once you place them in a scorching hot skillet, all that needs to be done is to brown each side and they are cooked to perfection. We prefer to use our cast iron skillet, but any non-stick skillet will work. Sound too easy? It really is that simple. 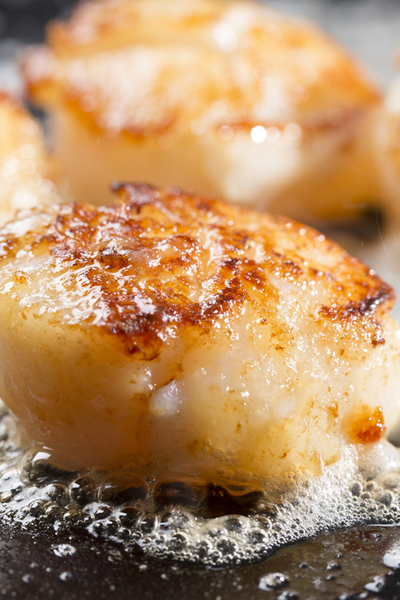 Scallops cook up perfectly when placed in high heat with a fat such as oil or butter for a short period of time. Because this cooking time is so minimal, we prefer to use both oil and butter to maximize the flavor that the exterior of the pan seared sea scallops can absorb. To make this dish even more flavorful we have added a herb butter glaze to be drizzled over top of the scallops after they have been cooked. Pan Seared Scallops served over a bed of asparagus. 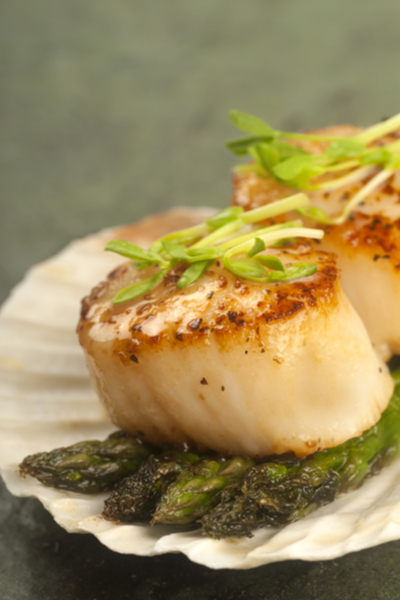 This not only adds another layer of flavor, but it also brightens up the pan seared sea scallops into something outstanding! 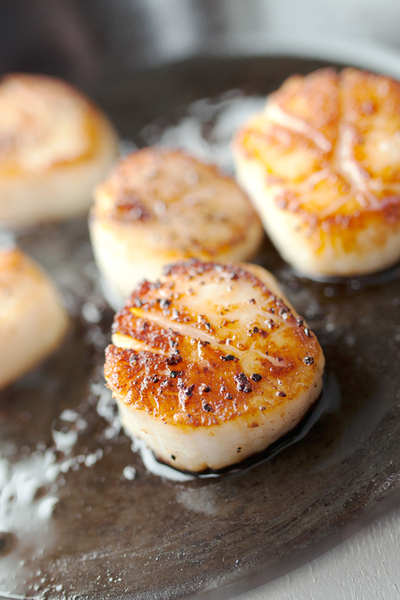 Plus, the extra heat from the glaze keeps the scallops warm until ready to be served! Delicate and easy to make pan seared scallops drizzled with a delicious and mouth wearing herb butter sauce. Cut off 1 tablespoon of butter and set aside. In a medium size bowl whisk together the remaining butter, garlic, shallot, lemon zest, lemon juice, parsley, thyme, chives, and salt and pepper until well combined and set aside. Season the scallops on both sides with salt and pepper. Heat 1 tablespoon of olive oil in a sauté pan over high heat until it begins to lightly smoke. Add in the scallops and turn the heat down to medium-high. After 2 to 3 minutes turn the scallops over making sure that the bottoms are golden brown. 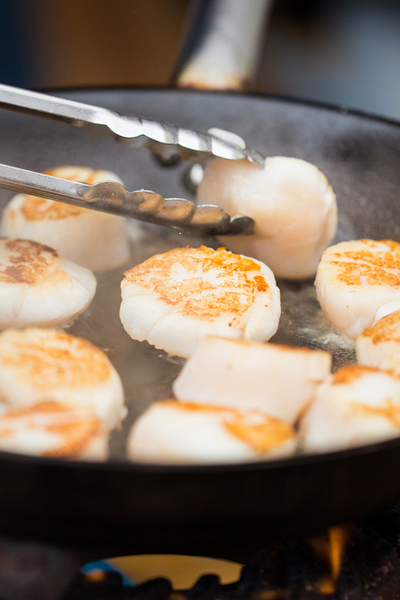 Cook the scallops for another 2 to 3 minutes or until the internal temperature is between 115-120 degrees F. Once removed from the pan the cooking process will continue for a final temperature of 125-130 degrees F.
Remove the scallops and set aside. Deglaze the pan with the white wine and cook over medium heat until it is almost evaporated. Add in butter mixture and whisk until melted. Drizzle the butter over the scallops and serve.